1 Placing an order online or by email. Place the selected products in your basket and fill out the form, or contact us via email by sending us the product codes of the selected items. 2. Receiving a confirmation of your order. After receiving an order we check and prepare the selected products and inform you of the following actions by sending a confirmation letter to your email. 3 Receive your order right away at one of our shops. When creating an order, indicate, in which of our shops would you like to receive it. We will notify you when it will be ready/for pickup. The payment will take place in cash, upon reception of the order. 4 Receiving your order at your nearest post office. If you are located outside of Riga or abroad, when creating an order, indicate that, delivery is required. When sending an order confirmation letter we will mail you a bill which will have inclusive shipping costs. The shipping expenses are calculated seperately for each individual order. The minimum sum of an order that is shipped within the borders of Latvia is 3.00 euros and 4.00 euros if international shipping is required. The order pre payment may be done by a bank transfer or Paypal. 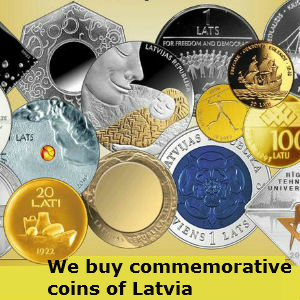 Within 3 days of receiving the payment your order will be shipped to the specified adress through Latvijas Pasts. The order delivery time is 1-3 working days when shipped within borders of Latvia and 7-14 working days when shipped abroad, (order delivery time may vary during holidays). Every single order has its own unique number in the postal system, which allows tracking of the delivery process. The number is usually like this: RRxxxxxxxxxLV vai RSxxxxxxxxxLV (the x is substituted by digits from 0-9). NB! Some product groups (all gold investment coins and buillon bars, expensive gold coins and gold products) can only be bought in person in one of our shops. If any further information is needed, please contact us by phone: +371 27754444 or via email info@eurogold.lv.